I was in need of a yummy new snack that I, and my girls, could enjoy. 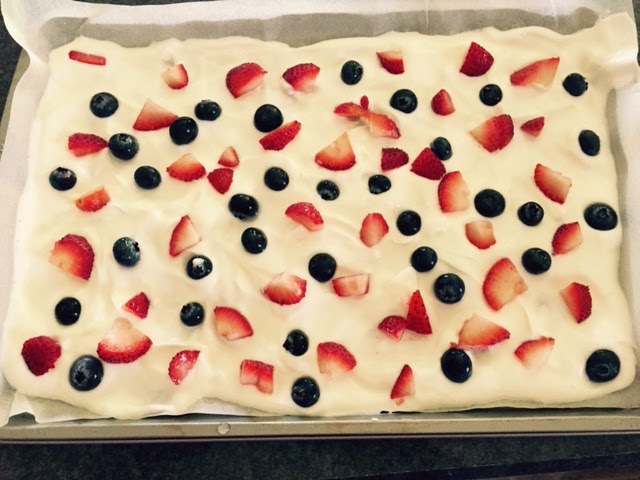 I've seen tons of different recipes for Frozen Yogurt Bark so I decided to keep it simple and make my own. I don't know about you but recipes that only have a few ingredients are pretty appealing to me! Not to my surprise, my girls loved it! This will be perfect snack for Summer time too! **You can really use whatever fruit you'd like. I think I'll try adding some kiwi and raspberry next time. You could even add pecans to it! Mix yogurt and honey in a bowl. Line a small baking sheet with parchment paper. Spread yogurt mixture over parchment paper. Use a spatula to evenly distribute. Top with strawberries and blueberries (or whatever fruit you'd like!). Cover with Saran wrap and place in the freezer. Wait about 2 or so hours then pull out and break the bark in to small pieces. Store in an airtight container in freezer.